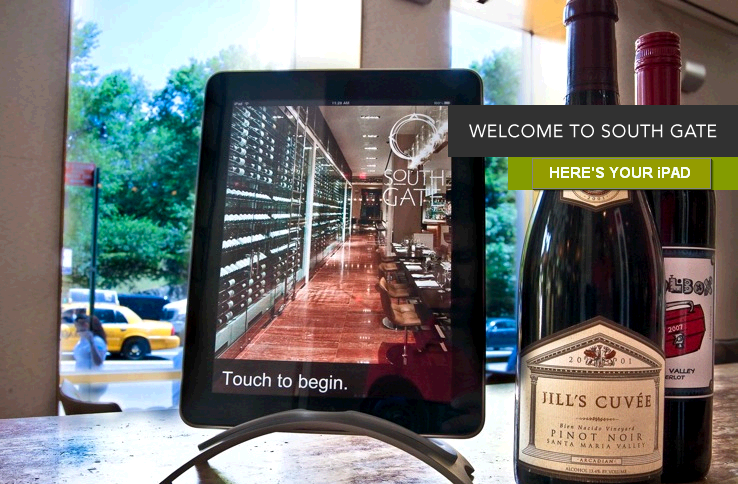 South Gate Restaurant on New York’s Central Park South now offers its extensive wine list to patrons on iPads. The Times says there’s a restaurant in Atlanta doing it, too, and one in Australia. Not so bizarre, I suppose, especially for a shmancy joint with a big wine list. But imagine the smudges on those things. I can’t help but picture some overstuffed, rich fatty smearing his meaty digits across the screen digging for the perfect pairing for his wild boar ragout. Imagination will have to suffice for me as I live a life of ordering off chalkboards. This entry was posted in Gadgeteering and tagged ipad, restaurants, south gate, wine. Bookmark the permalink.